The dust is starting to settle after Aung San Suu Kyi’s election win. A cascade of optimistic vibes has washed across Burma, and now its ripples are beginning to influence discussions — both popular and policy– around the world. Right now, the questions that we ask tend to be pretty consistent. Will the changes last? What do the military men really want? Is this too good to be true? But for too long the equations about Burma have been too simple. Aung San Suu Kyi = good; The generals = bad. Ethnic politics + Burman chauvinism = strife. Burma < Thailand. You all know the sums. Instead of rehearsing my responses to those questions, and my analysis of the prevailing equations (all of which I have done a fair few times in recent days, for audiences big and small), let me turn to some of the changing political equations that aren’t yet getting enough attention. First, for “reform” to get real traction the relationship between the Burman majority and the non-Burman minorities needs to be re-conceived. I sometimes suggest that former military commanders — familiar with the terrain, cultures and even languages of ethnic minority areas — are well-positioned to help negotiate minority issues. Compared to many urban Burmese they, at least, have some sense of why ethnic minorities have put up such fierce resistance. Relatively few urban Burmese ever travel to places like Myitkyina or Lashio, let alone to far-flung corners like Haka or Mong Hsat. Therefore, a big chunk of Burma’s reformist energy will need to focus on the inter-communal learning, sharing and compromise that comes with creating a peaceful, multi-ethnic union. On the long list of challenges that lie ahead I think this is the most daunting. Second, there are going to be tricky issues when the spoils of the transition are distributed and questions are asked about who most deserves a slice of the action. Burmese migrant workers living in Malaysia, exiles in Thailand, and countless refugees and others scattered around the world, are now looking closely at their prospects for return. Many will come back with suitcases bulging with skills, resources and contacts. But will everyone readily accept their return? Re-integrating a politically and socially diverse diaspora is rarely straight forward. If they choose to return home, their re-entry to Burmese society will change the equations and introduce all manner of unpredictable elements. Third, there are the 400,000 (or so) members of the armed forces that need to be taken into acount. For the past seven decades, young, ambitious Burmese have joined the armed forces, or married into it, in an effort to get closer to power and prosperity. 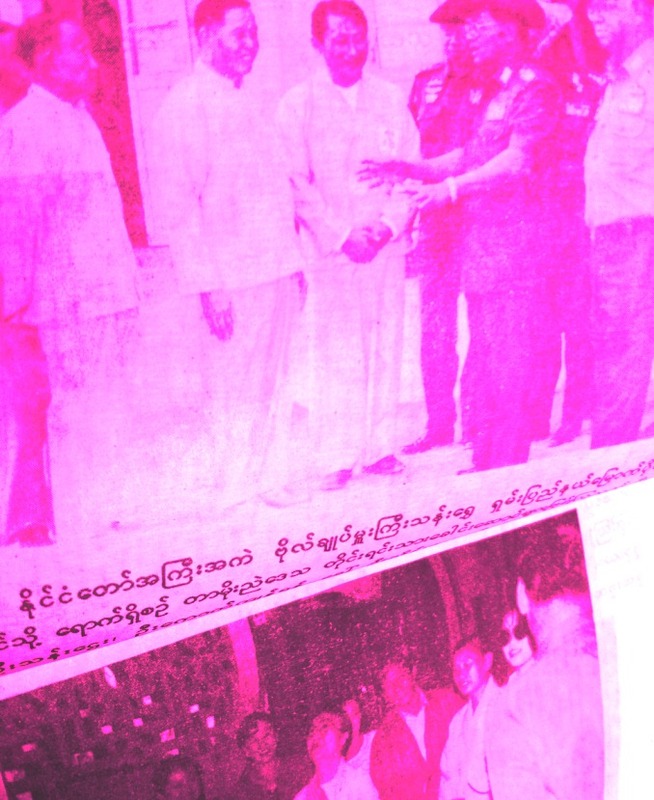 The process of demilitarisation of Burmese society is as sensistive as it is essential. In 2012 the armed forces are too unwieldy and carry too much baggage to provide effective internal security. And their tasking for international contingencies will need to be fully re-imagined. But as Thailand shows, it can be difficult to build a nimble and professional armed force that ever fully disavows political entanglements. With these three sets of issues in mind, President Thein Sein and his allies are hoping to change Burma’s equations. The events of the past week should give them extra confidence that many well-wishers, from Burma and around the world, are ready to contribute to this process. Many wonder what Burma will look like if it manages to get rid of the shadow of military dominance, and ethnic war, and grinding poverty. We hope it will be a much happier place. I certainly agree that it will be a wonderful day when a slogan like “Happy Land: Myanmar” can be proclaimed with a straight face. With that prospect in mind I have more writing and thinking to do. Realistic assessments of the changing equations are one place to start. #1. I’m afraid notwithstanding local knowledge the old adversaries are rather more likely to manifest some ingrained animosity and chauvinistic attitude to each other. Over the decades many Burmese had learnt to travel over difficult terrain served by very poor roads and rail links, just to survive, moving black market items from A to not B but Z, and in the process getting familiar with both terrain and dealing with the ethnic peoples on friendly business terms as equals. Besides we have civilian govt servants of various departments, serving or retired, who can help in this important reconciliation process. #2. Assuming that the change is meant to last, the sheer logistics of accommodating the returnees can be problematic. People on the other hand will be more than happy to benefit from the experience and expertise gained by those who have broadened their horizons. It will be need to be handled and resolved as domestic internal contradictions in the family, not as if they were class enemies like some entrenched exploitative and repressive ruling class. #3. Unemployment is the most dreaded scourge of any country and it’s the last thing demobbed soldiers would want to face. Perhaps the world class sweat shops in the SEZs likely to mushroom in the major cities and infrastructure projects will fill the gap. Many from farming families may wish to return to their villages provided the govt makes agriculture with land ownership and credit issues as well as farm mechanization with workshops for repair and maintenance a priority. The urban rural divide must be addressed. Satellite TV, VCDs and cell phones have bridged this to a certain extent. Employment opportunities remain the crucial issue here as everywhere else in the world. Many wonder what Burma will look like if it manages to get rid of the shadow of military dominance, and ethnic war, and grinding poverty. We hope it will be a much happier place. You betcha, Nich, and thank you. Tracing the reason why Burma < Thailand conclusion will most likely address the 3 issues mentioned. Thailand among all other SEA nation, has enjoy unprecedented stability and unbridled economic prosperity for at least the last century if not more. Therefore allow the country, with 'similarity in almost every respect' to Myanmar, to evolve to a democratic present. Myanmar never have that benefit of stability as well as economic opportunity. Similar to Myanmar, 2 important entities that hold Thailand together are The Monarchy and Buddhism. The British colonization ended the former yet inadvertently strengthen the latter sowing the seeds to present, THEN none existing, ethnic discords, an important factors Thailand never have to endure in spite of similarly diverse ethnic group. A significant part of the 2 ethnic groups the Kachin and the Karen are non Buddhist, making Buddhism the fabric to unity as in Thailand quite useless. The 3 factors that you mentioned may seem daunting since Myanmar problems are 4th generational starting with inherent evil of colonization to present. Yet the simple answer have always been in the example of Taiwan, Korea, as well as Thailand, the Philippines, China and to a lesser extend now Vietnam. Invented by USA and EU that have define the new concept to a world unity that has transcend ethnic, religious and nationalistic constraints, THE FREE TRADE, the very antithesis of SANCTION. The opposites to the above are N. Korea, China before Nixon visit as well as Vietnam before true re engagement make this point even better. Trading promote the basic need of the most vulnerable citizenry in so many ways. The desirable changes within Myanmar can never be sustained as long as the humanity within continue to be deprived of the most basic need. It must be pretty enviable seeing that the unprecedented stability of Thailand has been underpinned by 18 military coups so far, a world record never likely to be even aspired to let alone broken. Trigger happy but no staying power. As for the unifying value of the monarchy, Don Quixote, I doubt it there will be many takers in 21st C Burma. Perhaps you have in mind your kindred spirit Myanmar Patriots aka Schwebomin II (sic). The gospel of “free trade” – like stability, all rigged up by iniquitous treaties, protectionism where and when we are weak but not you, just hand over your natural and human resources on the cheap and we’ll repatriate all our profits, tax holidays, sweeteners, land ownership next please…the whole nine yards, thank you very much. Better to be exploited than not. And we’ve seen how your generals deal with China and the rest until now doing a roaring trade with them. Will they handle the lesser of two evils any better and can they be trusted with the guardianship of our country’s natural environment and human resources? You might be oh so willing to ignore the evidence of the last half century. Perhaps you are in good company, wealthy, powerful and rearing to go. Let’s just pimp the nation like Thailand. Remember one of Aung San’s unforgettable speeches? Happy days are here, mate. Haven’t you heard? Thank you for your continuing doom gloom, with reminders to all here @ New Mandala with the ultimate “what’s the use!” sentiment. Must surely make, according to your confession now OUR generals happy to maintain status quo regardless of the humanity within. Hard to soar like an eagle working with a bunch of turkeys? Do not be a turkey yet. #1 What is taking place can rather be best described as ‘adaptive changes’. This military government has prove this skill well. At his point any changes WILL benefit the citizenry more. Yet overall motive will be to preserve or even advance the dictatorship. Overtime (at least a few decades). with continued improved economic condition the generals will see the merits of leaving the changes permanent or even be persuaded to return to the barracks. #2 Myanmar has always a significant judicial frame work that has never been applied accordingly except to advantages of the military and its cronies. Historically Myanmar Citizenry has always embrace common sense Buddhist compassion/justice, especially in times of abundance. Providing assist to solicitors and judges through CBO’s ASAP within Myanmar with ‘interpreting abundant existing laws’, that involve property and ownership as well as much of civil disputes whether between individuals or groups and yes definitely ethnic groups. Used of existing laws and seeing the results will dignify,strengthen and promote ‘the rule of law’ as 1st choice to any dispute within. Especially now that there is a Hluttaw that will protest if not outright oppose unjust military behavior. #3 The West useless careless vilification and threat is the primary inducer of this military government paranoia and thus the resulting 400,000 Tamadaw. Once this threat is removed there will be an exodus of present enlistee/conscripts. 1/4 of present, if not more engage in outside business to make ends meet. Once civilian life become more attractive these will be the first to leave. This government with ‘adaptive change’ can be convinced to the profitability of not maintaining a large Tamadaw. Especially it now can use relation with N. Korea as an Ace. plan B surely deserves a medal for asserting that “#3 The West useless careless vilification and threat is the primary inducer of this military government paranoia and thus the resulting 400,000 Tamadaw(sic)”. Yeah right, they must be busy getting ready for an invasion all these decades of the marines storming up the Hlaing River in their landing craft or dropping from the helos. Naturally an exodus of present enlistee(sic)/conscripts from the Tatmadaw must be as straightforward as leaving the Sangha. Without question, Aung San Suu Kyi’s election to the Burmese parliament is a remarkable achievement. But what I have seen this week reminds me that it is only part of the story. The other part, hidden in the mountains and valleys of Kachin state and in villages of other ethnic minorities, is vastly different. It is one that Burma’s military-dominated government does not want you to see. Progress did not occur in Burma because military leaders suddenly realized that they had erred. It came about precisely because of international pressure. To remove this pressure at a time when the Burmese government escalates its brutality against a long-suffering people would be unconscionable and should be unacceptable to the United States. His and Derek Tonkin’s prayers have been answered as it’s only a matter of time before the sanctions are comprehensively lifted. After all Western govts never lose sight of the interests of Big Business. The ‘Virtuous Circle’ of Carrot & Stick Sanctions gets a more balanced treatment by The Irrawaddy. The claim that “Progress did not occur in Burma because military leaders suddenly realized that they had erred. It came about precisely because of international pressure,” seems to me not only overly confident about the impact of international pressure, but misses the ways in which reforms can serve elite interests without been about any “sudden realisation that they had erred.” In this light, the changes can perhaps be better understood according to what Gramsci called the “passive revolution,” in which reforms serve “to gradually and organically change a society in such a way that [meets] the demands of the ruling class” and undercuts what are potentially more radical popular demands. Exactly Stephen. The regime had to change tack and so did ASSK each trying to find a way out of the impasse. International pressure did have and still has an important role to play since there is no denying that we are where we are because the regime wanted legitimacy and greater economic opportunities, the latter definitely of mutual interest to the West. Many are optimistic about the eventual outcome; many others aren’t so sanguine. This may prove to be a slippery slope for either party, govt or opposition, albeit the arena and stratagem are chosen and planned by those in power to suit their own agenda. The dice is loaded but it all depends on the players, both international and domestic, both the leaders and the peoples of Burma. Could I request Stephen to expend this precise observation about “Passive Revolution” which is in fact happening in current Burma. It is of utmost importance that people see things as what they truly are.